When AV consultant Rich Swanson of Cygne Solutions brought the idea of IPTV to the new Pepin Heart Hospital & Dr. Kiran C. Patel Research Institute in Tampa, FL, part of the University Community Health (UCH) system, it promised to be a cost-effective, reliable way to bring bedside entertainment to the hospital's patients. Representing a European company long established in the IPTV world overseas, Swanson quickly discovered the project lost something in the translation. IPTV head end with rack-mounted satellite receivers (the silver boxes) and Visionary Solutions encoder blades (behind and below the blue patch cables). "The company used C-Ban satellite dishes to bring various entertainment channels into the system," Swanson said. "C-Ban dishes are 10 or 15 feet in diameter. You'd have to put up six or seven of those at every given site to get enough channels to compete with cable." Worse, with server-based technology there are only four card slots per server. Since the server uses one channel per card, you're looking at a huge amount of floor space to bring in enough channels. Finally, all the equipment came in from Europe and the television set-top boxes had to be shipped to Hong Kong for programming. Any of these obstacles might have doomed the whole idea, had Swanson not found Visionary Solutions (VSI) of Carpinteria, CA and its new multimedia processing platform. The new system eliminates the need for servers, cuts the rack space by two-thirds, expands the channel availability four times over, and costs about a third of any other solution Swanson could find. "These were truly plug and play," said George Evans, UCH's vice president and chief information officer. "Their product adheres to open standards, which makes it easy to integrate with other systems. We got it installed with no problem, on time, on budget and it performs as expected. It's an all-around good project." 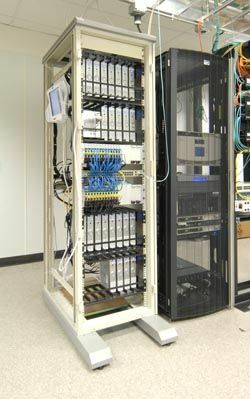 At the heart of the hospital's IPTV network is the edge distribution rack, a single rack system housing two VSI media processing platforms containing 25 AVN220 encoder blades. These devices encode the signals from 25 small dish satellite receivers-one channel per receiver, one receiver per encoder blade. Each platform chassis has enough slots to hold up to 17 encoder blades. "If you're comparing the server-based setup to the Visionary," said Swanson, "in the same rack space I can do 17 channels where that one server could only do four." Because it doesn't use a server, the IPTV system is not subject to downtime for maintenance, hackers or computer viruses. Cygne Solutions mounted a network switcher in the rack along with two redundant power supplies offering built-in backup in case one fails. From the rack, the video signal travels over the hospital's existing network to reach the patient through a large articulating mechanical arm that swings out from the wall behind the patient's bed. Rather than using the traditional wall-mounted television, Swanson installed a 12.5-inch monitor on the end of this arm, flanked on one side by a telephone and on the other by the TV remote control. The arm swings out from a wall unit that is actually a small computer that doubles as a decoder for the IPTV signal coming into the room. Evans said it is this arm and its attachments that receive the most "oohs" and "ahs" from visitors touring the hospital. A video signal, processed by Visionary Solutions' multimedia processing platform, travels over the hospital's existing network to reach the patient through a large articulating mechanical arm that swings out from the wall behind the patient's bed. Although some network administrators might question how all of this data is going to fit on their existing bandwidth, VSI's Will Bakewell said there are really only two places where bandwidth becomes an issue: transporting video and storing video. If the administrator has an issue with the amount of data his or her network will need to transport, it might be wise to use the new H.264 encoder blade coming out this summer. "The H.264 is roughly two times as efficient as MPEG2," said Bakewell of the new MPEG4 blade. "For a comparable level of video quality in resolution and frame rate it takes about half the bandwidth of MPEG2." An H.264 movie will also take only half the storage space as an MPEG2 movie. "It's actually only the larger networks that should choose H.264 for real time encoding-like the telephone companies that want to provide TV over DSL, or any WAN with leased lines and a high monthly cost to maintain a high-bandwidth link." Bakewell said the AVN220 MPEG2 encoder blades currently in use are a perfect fit for smaller networks like the one at Pepin Heart Hospital. "The demand to have everything on the network creates opportunity for our devices," said Bakewell. "Those administrators who prefer a second coaxial distribution network-and some still do-don't need us. But those who want just one network need Visionary because we provide the best way to get that done. We'll save them a lot of money and give them the best possible quality." "There are very few IPTV networks out there," said Evans. "I'm really surprised that it has not generated more interest. Maybe people were a little scared of IPTV because it didn't have a lot of presence. But I think the concept is a very good concept. There really isn't a lot to say about it: it's simple and it works. I'm always pleased with systems that there's not much to say about." Those are good systems in any language.